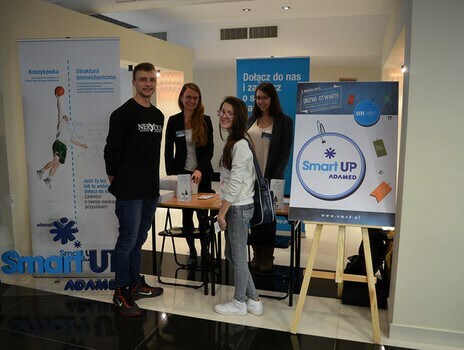 In early March, one of the patrons of ADAMED SmartUP, the Medical University of Lodz, opened its doors for meetings with high school and middle school students. The future university students could, among other things, get acquainted with the university’s educational offer and learn about the activity of student scientific societies. Representatives of the ADAMED SmartUP programme also participated in the event, talking about the programme and its initiatives. During her speech Anna Kosińska, ADAMED SmartUP Project Manager, described to the audience the tenets and objectives of the programme and presented the recruitment stages of the scholarship programme. She also announced a cycle of unique science courses at the ADAMED SmartUP Academy. Joanna Jurek, this year’s high school graduate and ADAMED SmartUP programme ambassador, told the participants about her experience at particular stages of her scientific development, difficult situations and ways of dealing with the problems. She also emphasised the role of determination and the ability to identify a research problem in achieving success.